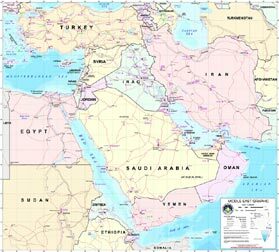 The Middle East is a transcontinental region centered on Western Asia, Turkey (both Asian and European), and Egypt (which is mostly in North Africa). The corresponding adjective is Middle Eastern and the derived noun is Middle Easterner. The term has come into wider usage as a replacement of the term Near East (as opposed to the Far East) beginning in the early 20th century. Arabs, Turks, Persians, Kurds, and Azeris (excluding Azerbaijan) constitute the largest ethnic groups in the region by population. Minorities of the Middle East include Jews, Baloch, Greeks, Assyrians, and other Arameans, Berbers, Circassians (including Kabardians), Copts, Druze, Lurs, Mandaeans, Samaritans, Shabaks, Tats, and Zazas. In the Middle East, there is also a Romani community. European ethnic groups that form a diaspora in the region include Albanians, Bosniaks, Crimean Tatars, Franco-Levantines, and Italo-Levantines. Among other migrant populations are Bengalis as well as other Indians, Chinese, Filipinos, Indonesians, Pakistanis, and Sub-Saharan Africans. The history of the Middle East dates back to ancient times, with the (geopolitical) importance of the region being recognized for millennia. Several major religions have their origins in the Middle East, including Judaism, Christianity, and Islam; the Baha'i faith, Mandaeism, Unitarian Druze, and numerous other belief systems were also established within the region. The Middle East generally has a hot, arid climate, with several major rivers providing irrigation to support agriculture in limited areas such as the Nile Delta in Egypt, the Tigris and Euphrates watersheds of Mesopotamia, and most of what is known as the Fertile Crescent. Most of the countries that border the Persian Gulf have vast reserves of crude oil, with monarchs of the Arabian Peninsula in particular benefiting economically from petroleum exports.